In this Alternate Take I would like to look at the way the fictional world of Winnie the Pooh interacts with, and is intruded upon by, the story on which it is based. While Disney has a long history of adapting books or fairytales, and acknowledging the process of adaptation in its opening shots - usually with a camera tracking into the pages of an opening book - both of its versions of Winnie the Pooh take this interaction further, by continually playing with the complicated relationship that exists between the written word and a film adaptation. A per Disney’s 1977 treatment of Pooh, we are introduced to our characters through a live-action sequence in which the camera travels through Christopher Robin’s playroom, picking out each of the main character’s ‘real life’ stuffed counterparts, before settling on a book - A. A. Milne’s Winnie-the-Pooh - which, in typical form, opens and allows us to see its pages. Matters are complicated from the start. Whilst the live-action aesthetic suggests that we are moving from the real world into Milne’s fiction, the narrator - voiced by John Cleese, though sounding at times so like Stephen Fry that it is almost a pity that it isn’t - tells us a different story. As well as entering Milne’s fiction we are also entering Christopher Robin’s imagination in order to follow the adventures he has created for his stuffed friends. There is therefore an ever-present tension between viewing the animated Pooh and company as a product of three imaginations; Milne’s, Christopher Robin’s and, of course, Disney’s. The narrator doesn’t just act as a vocal guide through the film, but also frequently interacts directly with the animation itself. He often seems to take the role of mediator, ensuring that events follow their destined course, which the characters frequently, and usually unwittingly, threaten to go against. In this sense he acts as a sort of ringmaster, ensuring that the potential anarchy eventually follows the necessary path. The character seems to embody the adult voice of Milne, providing structure to the wandering digressions typical of stories concocted by imaginative children like Christopher Robin. For example, we begin the story with Pooh asleep in bed, an image that is framed as an illustration from the book. In contrast with the image of the sleeping Pooh, the written prose suggests that Pooh is supposed to be wide awake and doing his exercises. The narrator has to intervene. Directly addressing Pooh, he reminds the sleepy bear that he is supposed to be up and about, and when Pooh still fails to respond, the narrator begins to physically shake the book, and by extension the illustration, and therefore the film image itself, in an attempt to wake the bear - something only finally achieved once the book has been rotated to the extent that gravity tumbles Pooh from his slumber. Later, the narrator guides Pooh to a note - discarded by Christopher Robin - when he fails to notice it under his own steam. Although we know that Pooh has to get out of bed, or find the note, for the narrative to move forward, there is a great deal of fun to be had in the anarchic delay before this occurs. This interplay between the structured, written words of the book and the malleable imagination of the child - and likewise between the book and the film (which constantly fails to obey the words on the screen) - is an integral part of the film, and one of its most dynamic aspects. The illogical logic of the English language is frequently played upon. When the friends are trapped in a pit with only Piglet and a rope to save them, Piglet does the logical thing, and counts the number of people to be rescued before dividing the rope into that many segments, none of which are now of any use. These moments begin to snowball, so the initial visual gag and humorous logic of the split rope is built upon by a series of verbal gags in which the two words “not” and “knot” become confused. One of the characters asks if Piglet can tie a knot and Piglet replies, “I can not/knot”, a statement which, when spoken out loud, does little to clarify the issue. The physical relationship between the book and the characters is also a fundamental aspect of the film. 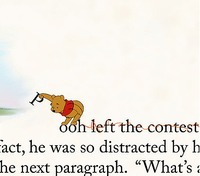 Pooh leaps from one page to another to find out how the story continues. On another occasion, he accidentally escapes the frame of the illustration and finds himself tumbling through the written lines below, and declares, “I wish that paragraph were longer...” The direct interaction with the book therefore is not just a visually interesting motif, but a central aspect of the narrative, and perhaps its most pleasing aspect is the tactile nature of the words and pages seen on screen. Even though we are watching a film, there is a constant sense that we are ‘reading’ the film, as if in book form. This is only emphasised by the recurrent idea that the animation is actually the book’s illustrations (recreating the E.H. Shepard drawings) come to life through the imagination of the reader. The physical words themselves play a major part narratively, providing the solution to a number of problems. 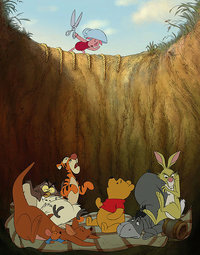 In Disney’s 1977 film, one particularly inventive sequence has Tigger and Roo - stuck high up in a tree through Tigger’s overexcited bouncing - extricate themselves from their predicament by having the narrator rotate the book, and the cinematic frame, so that the pair can simply walk down the now horizontal trunk to safety. Although clever, it is also a virtual dues ex machina, depriving the animals themselves from developing a solution. The 2011 film also features a number of sequences in which the physical properties of the book itself provide the solution to problems. In this film, however, there is always at least one other possible resolution, the existence of which are always obvious to the audience but not the characters, and are exploited for comedic purposes. The central sequence of the film involves the main characters becoming trapped in a pit, which they had previously dug in order to ensnare the Backson - a terrible mythical creature imagined by Owl after misreading Christopher Robin’s note which reads “Back soon”. 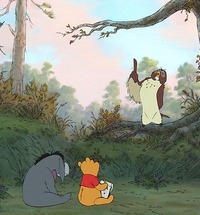 Three of the characters - Kanga, Owl and Tigger - have physical attributes which would allow them to easily escape the pit of their own accord, but they themselves do not realise this. Much is made of this at a comic level and at one point Owl actually flies out of the pit in order to deliver a motivational speech. When he returns himself to captivity, the others look at him in astonishment - we are sure they have finally realised what the audience recognised long ago - before confounding expectations by revealing that their surprise is actually an awed response to Owl’s speech and they congratulate him on his eloquence. The friends ultimately escape thanks to Piglet’s stature and Pooh’s hunger. Piglet is the only one who remains outside of the pit and, during an escapade with a helium-filled balloon, accidentally dislodges the paragraph hovering above the illustration of the pit, causing the letters to tumble down upon the captive animals. Spotting a honey pot teetering on the edge, Pooh assembles the letters into a pile - which the wide shot reveals is actually the sentence, “They used the words to climb out of the pit” - which he then climbs in order to reach it, thus freeing himself and his friends almost by accident. It is an entirely satisfying sequence because of the humour embodied in the animals’ failure to notice the obvious means of escape, the imaginative interaction of the animals with the written word, and the apparently accidental nature of this solution. It is particularly interesting, given the relationship that the film has with words, and with the constant reminders of the links to one book in particular, that the narrative structure of the film is a significant departure from Milne’s original work and Disney’s original portmanteau film - both of which utilise small vignettes through which we follow the friends’ adventures. Although the narrative is comprised of a series of Milne adaptations, the various narratives are combined into one feature length story in which all run consecutively. So Pooh’s search for honey leads him to a tail-less Eeyore, and the search for his tail in turn leads to the discovery that Christopher Robin has gone missing, apparently kidnapped by a fiendish creature called the Backson. The characters then set out to trap the Backson and rescue their friend. As I suggested in the short review, this is a move that may infuriate the Milne purists. Indeed, it has a significant effect on our relationship with the characters, since, unlike the original film - in which we feel like we are getting to know the characters over a period of time and through a series of adventures - this narrative spans a single afternoon. Yet this is not a significant issue. Rather than aiming for an emotional punch, which would be unsustainable and unsatisfying given the short time-span spent with the characters, the film instead focuses on the playful, fun aspects of a single adventure. At the end we feel like we have dropped in on, and caught up with, a few old companions, and the narrative structure and tension between the narrative strictures of the book/narrator and the imaginative freedom of the film/child’s imagination constantly reaffirm this idea. Rather than lingering on heavy issues such as death, evil and other dark forces - something not unusual for a Disney feature - the film instead feels simpler, and more light-weight. Like a momentary diversion. Like an afternoon spent playing in the woods with our friends. This Alternate Take was published on May 01, 2011.